With the new release of the Kawasaki Teryx 4, Long Travel Industries (LTI) was one of the first companies to get their hands on the new platform from Kawasaki. It didn’t take the team at LTI long to dive into the Teryx 4 and develop a long travel platform for the car. In typical LTI fashion the boxed arm kit for the Teryx 4 kit is 5 inches wider per side increasing the stance 10 inches overall and adds an additional 1 3/4 inches to the wheelbase as well. The long travel kit for the Teryx 4 is 100% bolt on and requires no drilling or modification to the vehicle. The boxed arms are constructed of 4130 Chromoly plate and fully TIG welded to create the toughest A-Arm on the market. The arms feature 7/8″ spherical bearings with stainless steel tapered pins to increase the strength and durability of the suspension on the Teryx 4. With an additional width of 5″ per side this increases the wheel travel to a staggering 14 inches of travel. This makes the perfect combination for the Kawasaki Teryx 4 to tackle the rough terrain of the desert with ease! The additional 1 3/4″ added to the wheelbase allows you to add larger tires to your Teryx 4 without having to worry about tire rub. 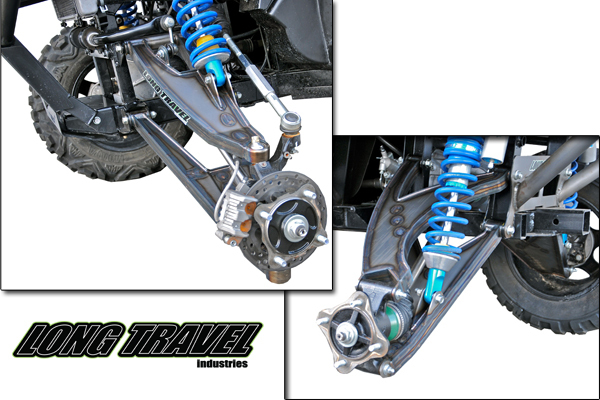 All Long Travel Industries suspension kits come with a set of King 2.0 coil-overs with piggy back shocks that have been custom valved for the Teryx 4 to give you the best ride possible in the harshest of terrains. LTI and King have spent the time need to build the ultimate shock for your Teryx 4 that will complement the strength of the boxed arms from LTI. Also included in the kit are a set of 300M axles that are the final piece of the puzzle that make this kit indestructible. Long Travel Industries (LTI) was established in 2005 when the Yamaha Rhino hit the off-road market. 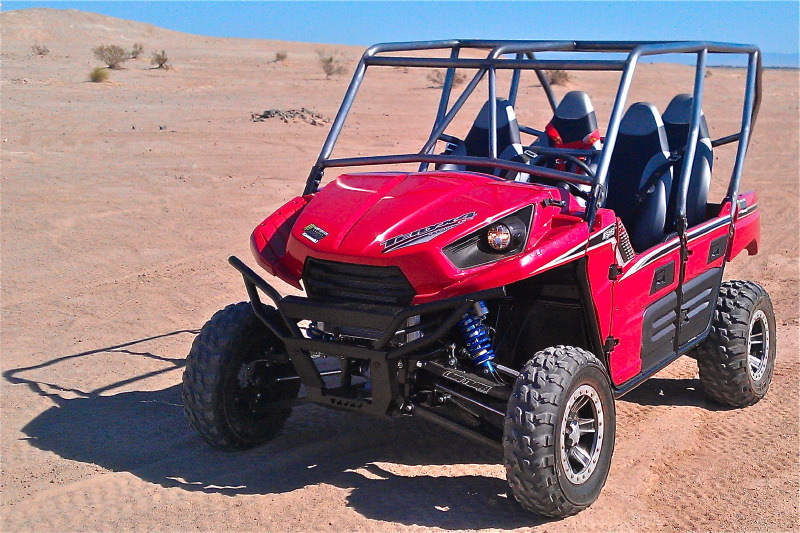 In the last 6 years LTI has established themselves as a leader in the Side X Side and UTV market. Manufacturing parts for the Kawaski Teryx, Teryx 4, Polaris RZR, XP 900, RZR 4, and the Yamaha Rhino to name a few their parts can be seen from coast to coast wether your on the track at the races or out for a weekend ride. For more information about purchasing from Long Travel Industries or becoming a dealer please call 714-783-7491 or visit www.longtravelindustries.com.